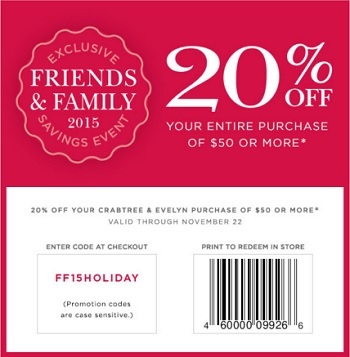 Enjoy Friends & Family Event at Crabtree & Evelyn stores in the U.S. and online! Print a special sale coupon and receive 20% discount on your entire purchase of $50 or more! Coupon must be printed to receive the offer. Online use promo code FF15HOLIDAY. Source of the information is Crabtree & Evelyn. Offer expires 11/22/2015. More details available at Crabtree & Evelyn stores.